A gravity water project delivering clean water and a latrine to individual houses, education for maintenance, long-term hygiene and sanitation, and the preservation and reforestation of the watershed. The water supply and sanitation project in the community of San Isidro, Municipality of Matiguas in the department of Matagalpa is a gravity flow system that is benefiting 34 families. The system is fed by a spring that is located on the hill of Quirragua and serves the community of Quirragua, Carmen and San Isidro. This spring capture is constructed of simple brick and mortar, has an internal filter of rock and sand, a collection box with a metal lid for inspection, and an inspection cover for the filter. The conduction line for the community of San Isidro starts at the tank of the community of Carmen and consists of 1331 meters of PVC pipe (a combination of 1” SDR 26, 3/4" SDR 17, and ½” SDR 13.5). It has a capacity to of 42 liters of water per minute. The tank is constructed of reinforced concrete with steel # 3 rebar. The concrete used for construction of this tank is 3000 PSI and the tank has a capacity of 10 cubic meters. Work on the distribution trench began May 19. The trench is being dug one meter deep, with the aim of ensuring greater durability to the pipeline and therefore lower the maintenance cost for the community. In total 7743 meters has been excavated, pipes going from 1/2" up to 1 1/2" have been installed. 6 subterraneans crossing have been constructed. One 36 m suspension bridge has been constructed to receive a 2" pipe. •	Ensure the logistics for the APLV staff during the execution of the project. •	Home visits to encourage family participation. •	Two training session with nine members of the Water Committee with the themes of responsibilitie, functions and leadership. •	Four community assemblies on the topics of health, hygiene, sanitation, watershed conservation. •	Four meetings with the Water Committee to assess progress of the work. •	Coordination between the MINSA (Ministry of Health) and MINED (Ministry of Education) to develop workshops for students and coordinate with community health leaders. •	Two training sessions with the 9 members of the Water Committee on leadership tasks and functions. •	A workshop for the 40 families on solid and liquid waste. •	Workshop with the Water Committee on health monitoring system and water-borne diseases. •	Three training sessions with beneficiaries on use and management of water, personal hygiene and food hygiene. •	Four training sessions with students on school and environmental hygiene, water use and management, food hygiene and household sanitation. •	Two home visits to follow up on the guidance given in trainings and lectures. Some technicians, Jackie Powell from Agua Para La Salud and I set out to tour the projects of San Isidro, Quirragua, and El Carmen. 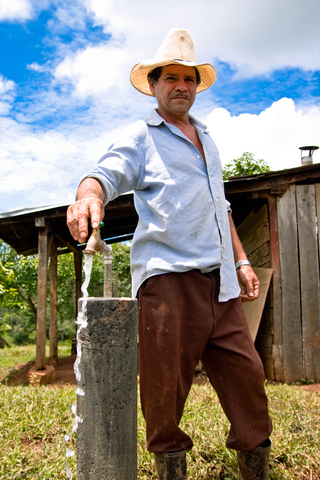 (Quirragua is the spring site that provides the water for all three communities.) After a long morning of driving and horseback riding, we stopped at a school in San Isidro and had a discussion and then lunch with some of the committee members and residents of San Isidro. It was very apparent that a lot of work went into the project and it really seemed to bring the community closer together. There were stories of children digging in the trenches because their parents were not able to. This community wanted water really bad and has definitely earned it and appreciates it now that they have it. Q: Are there any special experiences you would like to share about the project? And women went to help too and lots of children because they all wanted the water... they really value water. Because when somebody just gives you something, you don´t value it anymore. So this is my experience of just how everyone was involved. I already said some of the kids participated, but not all of them. But the best part was the health workshops that APLV did. Sometimes in the school, we provide health classes, but it is better when outsiders come and emphasize the neccessity of it because the importance is coming from another person. So Liliam and Kelia came and gave classes and one was able to talk to them directly about personal health and cleanliness. So they came to help us. They also came and gave educational talks about reforestation, which helped the kids put theory into practice. But it was so important to not only teach theory but to also give someone the opportunity to practice. APLV helped our community as well as our school. See the entire photo album. The first site we visited was located two hours from Rio Blanco and is a current project site serving the three communities of Quirragua, El Carmen, and San Isidro (111 families in total). Upon arriving, we hopped on horses waiting for us at the entrance of San Isidro. The horses were necessary for two reasons: the rainy season in Nicaragua creates deep pockets of mud difficult to pass through on foot and the three communities are located several kilometres away from each other with no road access. This large project began when the community of El Carmen began to look for a water resource in order to provide water for their community. The spring they located was eight kilometres away in the village of Quirragua. It was decided during the initiation of the project to include the village of San Isidro as well to the conduction lines since it is located between El Carmen and Quirragua. First, we visited the school of San Isidro and met with the local water committee or CAPS (Comité de Agua Potable y Saneamiento or Committee of Potable Water and Health). From their introduction and brief words shared it was clear that APLV has not only formed excellent relations with the community but APVL has also created tight work strategies within the communities. Each CAPS committee not only has a President, Vice President, Secretary, and Treasurer but there are also individuals with the titles of Health Promoter, Environmental Promoter, and a Maintenance Representative. Each of these posts works alongside their APLV counterpart throughout the implementation of the project. The APVL counterpart gives several educational workshops members of CAPS and the community in order to assure the communities knowledge of the project, system maintenance, healthy habits, and environmental care. 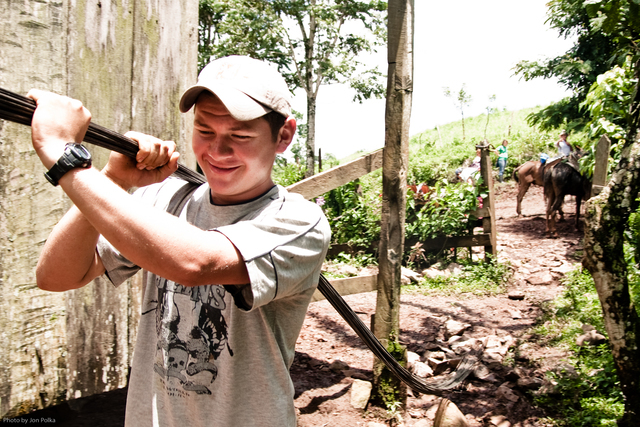 After lunch we saddled up to visit the spring site located in Quirragua. CAPS and other community members joined us on our trek to the site and once we arrived it was quite the communal celebration of drinking water from the spring. Overall it was an excellent day spent seeing and learning how the communities and APLV work together. The water supply and sanitation project currently underway in the community of San Isidro, Municipality of Matiguas in the department of Matagalpa is a gravity flow system that is benefiting 40 families. The construction of the storage tank began on 01 June 2010 and is 90% complete. The tank is constructed of reinforced concrete with steel # 3 rebar. The concrete used for construction of this tank is 3000 PSI and the tank has a capacity of 10 cubic meters. It is estimated that the tank will be completed by the end June..
Work on the distribution trench began May 19. The trench is being dug one meter deep, with the aim of ensuring greater durability to the pipeline and therefore lower the maintenance cost for the community. To date, 2,200 meters has been excavated, which is equivalent to 27% of the total. 1,960 meters (24%) of pipe has been installed and 20% has been tested and buried. •	Ttwo training sessions with the 9 members of the Water Committee on leadership tasks and functions. •	Two workshop with the Water Committee on health monitoring system and water-borne diseases. •	Three training sessions with students on school and environmental hygiene, water use and management, food hygiene and household sanitation. Difficulties encountered during the implementation. The major difficulties encountered so far in implementing the project are the following. 1. Heavy rains that caused the open trenches to fill in and increase the work for community. A Drinking Water Committee was formed early in the process of assessing this project and has remained organized and has demonstrated leadership in the community. The creation of this committee is a key element in ensuring the sustainability of the project. The committee members received training in management, administration, maintenance, watershed management and efficient use of the water resource. The objective of the Health and Higiene Education Program is to guarantee that the families of the community receive the maximum possible benefit from access to clean water and sanitation. The APLV team worked directly with families and school children on personal hygiene, gender issues, latrine maintenance, food handling, trash management and water conservation. 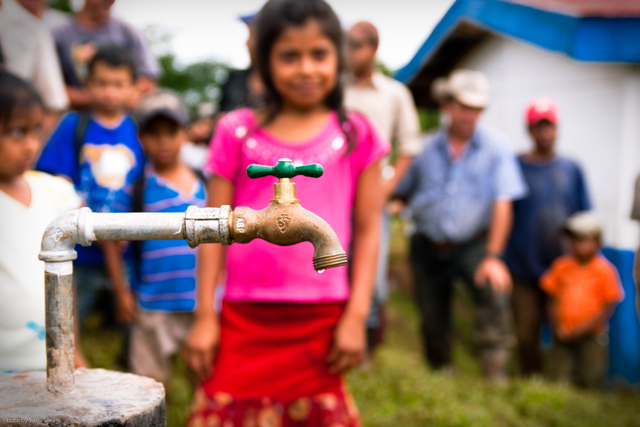 Finally, Agua Para La Vida has been working with rural Nicaraguan communities for over 20 years. Our long-term presence in the region enables us to maintain contact with our partner communities to provide on-going assistance. The start of the project was delayed due to the unavailability of pipes from the distributor. This caused the work to begin during planting season, which has delayed progress somewhat.